Location: 2001 Gayley Rd, U.C. Berkeley, Berkeley, Calif.
As the fourth Chairman of SNCC and later the "Honorary Prime Minister" of the Black Panther Party, Stokley Carmichael was without question an important figure during the Civil Rights Movement. Following his freshman year at Howard University, Carmichael embarked on the Freedom Rides, eventually spending 53 days at Parchman Farm and becoming the youngest detainee at just 19. Though he wasn't the first to use the term "Black Power," Carmichael is credited with popularizing it. He first used it following his arrest for joining other black leaders to continue James Meredith's "March Against Fear" after Meredith was shot at the beginning of his journey. However, it was Carmichael's "Black Power" speech at U.C. 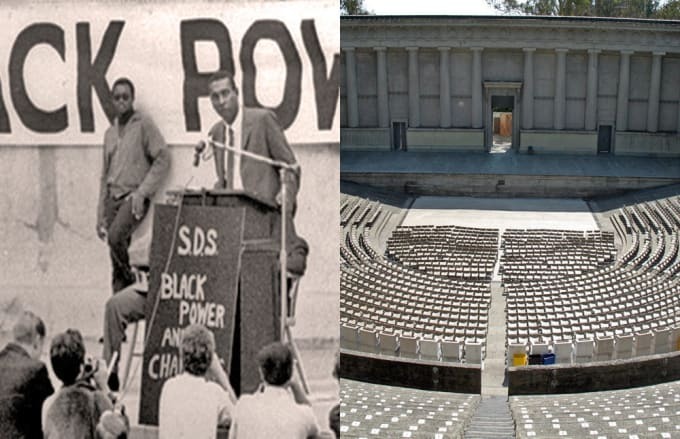 Berkeley's Greek Theatre in October 1966- where he called out the recently passed Civil Rights bills as being created for whites, not blacks-that is best remembered. He highlighted that blacks would continue in their quest for total liberation, but questioned whether or not whites would allow it. The William Randolph Hearst Greek Theatre, or simply the Greek Theatre, plays host to U.C. Berkeley graduation ceremonies and addresses by other speakers. In the past, President Theodore Roosevelt, the Dalai Lama, and (obviously) William Randolph Hearst have spoken there. It was added to the U.S. National Register of Historic Places in 1982.